For a professional contractor or a serious woodworker, getting the best possible outcome is essential for which a cabinet or contractor table saw is one of the indispensable tools. However, if you wish the best of both worlds, a hybrid table saw is what you need, which has an enclosed cabinet and design as well as weight of a contractor saw. While ease of use is what a contractor style guarantees, powerful performance is the assurance of a cabinet saw. If you need both at a lower price but with an extension table of high quality and a built-in miter gauge, the Shop Fox W1824 hybrid table saw can be your best bet. Most hybrid saws do not come with extension table and miter gauge but this one gives you both bonuses at more competitive price. This Shop Fox model is designed to boost the overall performance as well as productivity. Combining the contractor style features into a cabinet style design, this hybrid table saw with its 400 lbs of weight stands highly stable while in use in a workshop. It can cut through any kind of wood without wobbling. 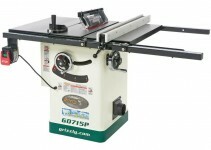 Although bulky, the tool is easy to carry just like the Grizzly G0715P and a few other saws in our table saw reviews. Both these tools seem quite similar with general specifications but the most obvious difference is the composite extension table. Furthermore, Shop Fox has best possible blades on offer, which makes it possible to have accurate and clean compound cut along with a dado cut with superb ease. Well, this model has a variety of features as well as specifications and is actually long enough to cover them all. The list covers everything from the table extension dimensions to motor power and from different adjustment options to reliable blade guards. Due to vast details, the brand has touted this model as “the envy of any shop”. Well, is it so appealing? Let’s find out! The cabinet is adorned with primary powder coating paintwork, while the full exterior of the model is in white. This combination makes this model stand out in any busy work area. The table height is 34 inches, while its size including the extension is 27 by 55 inches. The table and extension wings are made up of precision made cast iron material, while the included extension table is composed of low-friction material, both of which gives you a high end cabinet style build. The extension table seems to be a flat laminate-layered plank capable enough of supporting an under mounted router easily. It comes with standard and dado blade table inserts, a 4-inch dust port, and a 10 inch 40 tooth blade. The unit also boasts cast iron trunnions, which is responsible for giving you a longer lasting feel. The cast-iron wings as well as top are smoothly ground and are truly quite flat. Both blade height and angle adjustments are very smooth and easy. The maximum rip capacity is 30 inches, which is again the same as the grizzly model. This capacity is sufficient to work with a variety of boards you tend to tackle daily in your workshop. With the help of the extension, you can extend the table to reach maximum dimensions of 27 x 55 inches. This model is actually a specially built workplace saw aiming to handle a myriad of timber shapes and sizes of timber. This unit from Shop Fox comes with 2 HP motor, which is the same as that of Grizzly G0715P. However, the difference is in amps. This motor gives 16/8 amps, which is sufficient for daily heavy-duty wood cutting. Another difference is in terms of motor type. The unit features a TEFC capacitor‐start induction motor that works by pulling air over its fins. This mechanism retains an optimum performance level whenever the unit is at work. The speed of motor is same as that of aforementioned Grizzly’s model, which is 3,850 RPM (also the speed of arbor). Another similar thing between both the models is the usage of serpentine belt drive and pulley system. This system ensures efficient and easier transfer of power while making the unit run with less noise. It is also responsible for generating more torque with minimal slippage while cutting the densest surface. Just like the Grizzly model, this one is prewired for 220v, although you can make it work at 110v. The performance is truly reliable but does exceed that of a few other models that are pure cabinet saws. However, the unit has enough power for serving a majority of home shops. You can easily but slowly rip 5/4 hickory tree wood and gain 3⁄4″w x 3⁄4″d dadoes in spruce. The blade is of the standard 10-inch size and features an arbor measuring 5/8″. For using a dado, the highest possible width that this unit accepts is 13/16″. At 90 degrees, the highest possible depth of cut is 3-1/8″, while moving the blade up to 45 degrees gives the cut depth of 2-3/16″. The blade tilts left and its stop ranges from 0 to 45 degrees. The distance from the table’s front to the blade is 11.5 inches at maximum cut, while the same to the blade’s center is 16 inches. This hybrid model comes with an adjustable Camlock fence that is well designed. It features polished nylon faces, glides smoothly and easily, and locks itself securely. The T-shaped fence is famous for its excellent accuracy as well as cuts with maximum precision. This is something that any user will rejoice having it in their hybrid table saws. The fence is strong and is protected without deflection. It is easy to use and is quite shrewd. It is more commended for its reliability and convenience. This hybrid model comes with an interchangeable riving knife acting as the spreader existing on the blade guard assembly. As a result, it gives the desired protection for almost all non-through cuts. The plate made up of metal does not allow the newly cut piece to pinch the blade due to which there is no kickback experienced. The pawls stop the wood from moving in case it senses a situation resulting in any kickback. The major difference between the riving knife and spreader is the mounting location. The riving knife mounts under the highest point of rotation of blade. There is enough height difference between the blade and riving knife so that the work piece can go through the blade at the time of non-through cuts. The riving knife plays the role of the hurdle behind the blade so that your hands do not get pulled into the blade in case of a kickback. This is a cool, handy safety feature. Designed to be released quickly, the blade guard is composed of polycarbonate material and features self-governing lifting sides along with retractable pawls. While the clear guard enables you to view the blade cutting the piece throughout the full operation, anti-kickback pawls keeps away any backward movement of the piece that is being cut. The guard lifts when the piece goes into the blade and retains the contact with it throughout the cut. You can position the pawls away from the piece. Both the knife and deluxe guard are easy to remove whenever you have to make any adjustments. One of the most expected hybrid saw features is knee switch. These switches, available in cabinet saws, are also included in this model. The saw also comes with the typical 4-inch dust port for gathering all saw dust so that your workspace remains clean as much as possible. * The model boasts top quality cast iron construction to ensure you longer lasting performance. * The saw has all basic safety measures for safe performance while cutting the wood. * The 10-inch blade is simple to detach and replace, whenever required. * The fence system is easy to use and ensures matchless accuracy. Its quality along with cast iron build, belt drive, and gauge are responsible for confidence and great quality of cuts. * Cast iron trunnions ensure boosted accuracy and stability. * The model ensures clean and quiet cuts through the wood. * The tables are adjustable with the variable heights and blade angles, which adds to your convenience. * You are ensured of quality customer service through systematic technical assistance to get started with the assembly if you are a novice. * Assembling this unit needs some effort. This is because the blade alignment is tough to accomplish in the close captivity of the cabinet. The 4 hex trunnion bolts are incapable of keeping the blade in place. Moreover, the manual is not adequately detailed or fully precise to ensure assembly without any hassle or issue. However, the customer support is cool enough to overcome these deficiencies. 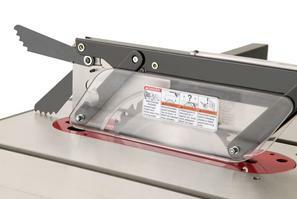 * The included insert plate is thin due to which it is tougher to have zero-clearance plates. Nevertheless, you can purchase a few fitting planks. * The shipped miter gauge is delicate even though you can replace it effortlessly. * The power cord is shorter. It is not even 6 feet long. * More of arbor tends to run out than expected although it does not compromise performance. Well, these cons are small issues that do not tend to overshadow the pros. Therefore, you can surely consider it if you are a hobbyist looking for a reliable table saw. The Shop Fox W1824 Hybrid table saw has everything to please countless customers, ranging right from a handy range of features to high-end parts. Those who are fans of this brand are likely to admire this unit. For the features it encompasses and price at which it is available, this model is actually not among the cheapest brands. This is perhaps because you are getting a genuine cabinet saw for the price at which other such saws are available. Without any flaws, this unit reflects the engineering expertise of the makers through its solid build promising to last for years without any hassle. With proper warranty, it is easy to conclude that why one can be confident with this hybrid model. Usually, those running a workshop and are on a budget, cost and performance are often a trade off. However, a meticulously thinking and reputable brand can keep this trade off at bay. This is exactly for what Shop Fox is admired, by making a range of superb quality products. The W1824 table saw is just one of those fine products. This model is larger than the Grizzly but it does stay back ever in terms of output and performance. In fact these two are at par with the more economical Grizzly version. Still, this model is good value for money. While chances are there for you to come across a negative experience or customer review, none of them is so powerful to put you off. This is because of the pros that the customers are enjoying once the unit is assembled, up, and running. This one is a well-constructed hybrid table saw worth the effort and money for its ease of use as well as ability to adjust to fulfill all your personal requirements without compromising the cut quality. It has enough power for performing well in any home shop.